The Best Quality, Value & Service on eBay! The tray is then impregnated with a waterproof and mould resistant stain and finally finished with a premium quality wax. Do not use the bath tray to sit on whilst in the bath or shower. This item is to be used at your own risk, w e will not be held. FITS 56 CM BATHTUB INSIDE. Made from 100% natural eco-friendly bamboo. 1 Piece Bathroom Corner Caddy. - Use it at bathroom, kitchen, garden, living room, etc. - Made of quality stainless steel, durable and not easy rust, easy clean, saving space. - Hollow design for drainage, to avoid bacterial growth, better for family health. Large enough to put large bottles on the caddy. Total Height of rail 7cm. Modern in design and would make a focal feature of the room. Bathroom Caddy Stainless Steel Shelf Shampoo Rack Holder Storage Lock Suction Cup. UNIQUE SUPER LOCK SYSTEM. Quality Stainless Steel - Never rusts or flakes. Parcels must be signed for on arrival. BT, IM, PA, ML, KA, G, KY, PH, DD, AB, IV, KW, HS, ZE. 1 Piece Bathroom Corner Caddy. - Use it at bathroom, kitchen, garden, living room, etc. - Made of quality stainless steel, durable and not easy rust, easy clean, saving space. 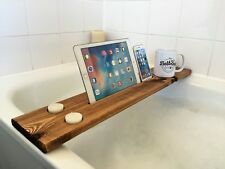 The Bathtub Rack is a perfect way to take a bath! Relax for hours in the tub with a book, glass of wine and bubble bath as this bathtub caddy has a book support that folds away when not in use and a spot to slip in and hold your wine glass securely. OVER DOOR KITCHEN TOWEL RAIL HOLDER RACK BATHROOM ORGANISER STORAGE HOOK HANGER. Save space in the bathroom by using our wall mounted shower caddy bathroom basket to organize your bathroom shower accessories and use the integrated hook to hold your shower scrub or sponge. 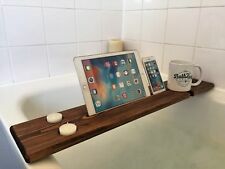 Luxury Bathroom Bamboo Bath Shelf Bridge Tub Caddy Tray Rack Wine Holder Bathtub Rack Support Storage. 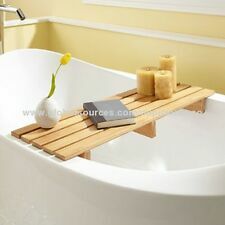 Luxury Bamboo Bath Bridge Tub Caddy Tray Rack Bathroom Shelf, Slim Design, Extendable. Type : Bath Caddy. It dismantles for easy cleaning and features a ventilation hole for quick drying and a non-slip base. Wash and dry by hand. Versatile storage. Dismantles for easy cleaning. NEW SOAPLAND Glazed cream Art Decor BATHROOM ToothbrushTumbler unique DecorGIFT. Ceramic/Porcelain with a Unique pattern/shape. that you hadn't thought of ;. Do not bend down for your sponge, soap or razor. Without doing any DIY, this shower basket can be stuck to every non-porous surface. It makes for flexible storage space in the shower, bath and guest toilet. MDesign Sink Organiser – the Perfect Caddy for Your Kitchen or Bathroom Stainless Steel Soap Dish and Tidy Clear and Brushed. Practical soap tray by mDesign - hygienic and convenient! Featuring ample space for your bar soap and your sponge scourer, this sink organiser will look neat and tidy in your kitchen or bathroom.